On the east side of Beech Mountain, in a village called Rominger, there lived a “circuit rider” preacher. This Methodist minister preached at the Piney Grove Church near his home. He also ministered to neighboring village churches and to many rural families within a day’s ride on horseback. He was always on call, day or night, when sickness or some other need arose among his parishioners. This Methodist minister was Wesley Smith Rominger, whose family had lived for some time in the area, thus the name given to the village. Smith Rominger was a small man, who had difficulty mounting his horse for his scheduled church services or his sudden and unexpected calls to homes where someone was in need. He always led his horse to an enormous solid rock close by, stepped upon the rock and mounted his horse with ease and rode to his destination. Many depended on his quick response. 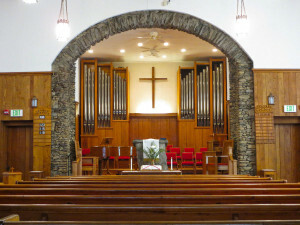 In the Banner Elk township, there lived a Presbyterian minister, who had come from Georgia as a young seminary student to help establish a church. The first wooden church he had helped to build was now too small and the community was in need of a larger, more permanent building for the growing congregation. Talk of a new church began in 1911 and soon the actual work began on a structure built of native stone. This Presbyterian minister was Edgar Tufts. His responsibilities and duties were similar to those of Smith Rominger. He traveled on horseback to Blowing Rock and Cove Creek to preach and had many families throughout Avery and Watauga Counties who called upon him for help. The paths of these two preachers crossed on many occasions and they became friends. On a visit to Smith Rominger’s home, Edgar Tufts saw the large rock, near the Rominger house, which was used as a step for mounting a horse. 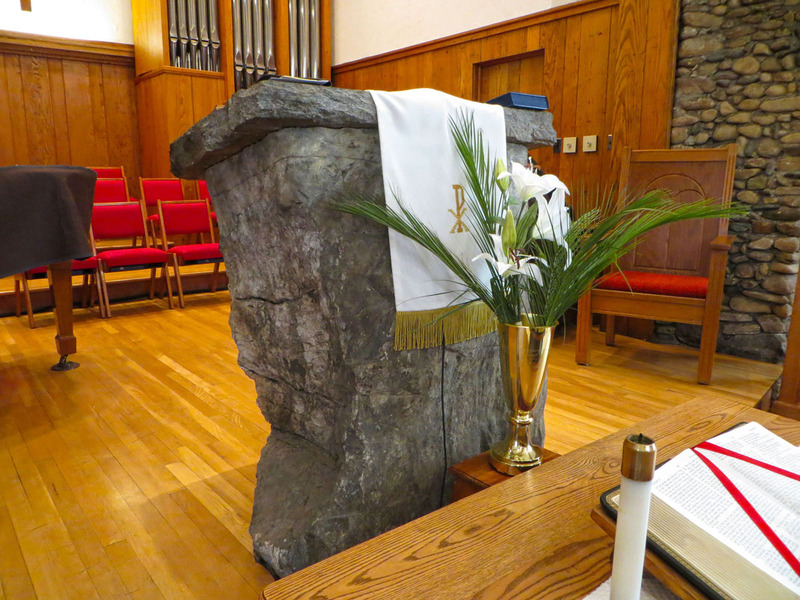 Reverend Tufts was impressed with the size and shape of the rock and thought it would be an appropriate and attractive pulpit for the new church at Banner Elk. Mr. Rominger agreed. He not only donated the stone to the church, but delivered it! The large stone was loaded on a sled and pulled by a yoke of oxen over the up-and-down, curving Laurel Creek road all the way from Rominger to Banner Elk. The trip was slow. It probably took the whole day to travel the seven miles with such a heavy load. The persons responsible for the delivery of the huge rock were Mr. Rominger’s youngest son, Coy Rominger and several older grandsons, Charlie, Clyde and Grady Rominger. (These three were the brothers of Howard Rominger, who provided the information for this story.) 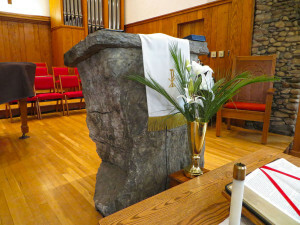 Reverend Tufts and the congregation of the Banner Elk Presbyterian Church were very appreciative of the pulpit stone which had been given and successfully delivered. Due to the size of the stone, the placement in the church was difficult. The large rock was set in concrete and the platform built around it. A slab of cut stone was placed on the top for a more level surface. This sturdy, solid rock may forever be a symbol of man’s giving, for the love of God and His church.